Rather than reviewing an obvious release like Ryan Adam’s latest release, I’m continuing with the less known stuff. 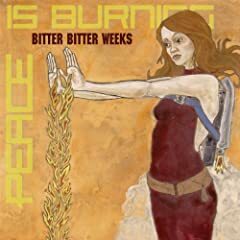 Bitter Bitter Weeks latest release Peace Is Burning Like a River have diverged from their more somber sounds in a big way. This is full of bright shiny 60s style guitar work, imagine The Delays swapping their synths for guitars. Brian McTear’s vocals match the mood beautifully with a light and sweet vocal. Even the lyrical content feels more cheerful. I’ve been listening to this album, both in the car and on my MP3 Player – I have to say it does sound far better when given a chance to breath in an open space than with earphones – even these cracking Sennheisers. My recommendation is atleast have a listen to the tracks on Bitter Bitter Weeks’ MySpace site. If you’re a Delays fan then don’t waste time – order the album NOW! Lots of thumbs up from the Monster.